E. Kyle Datta, senior director of the Colorado-based Rocky Mountain Institute and RMI's man in Hawaii, is working with government, business and civic groups to shift the state away from oil-based energy to biofuels and renewables. IF CONTINUED reliance on oil is risky for the nation, it is all the more dangerous for a state in the middle of the Pacific Ocean whose economy rises and falls on imports of nearly everything -- food, goods, materials and tourists. You'd have to be living on the subplanet Pluto to be unaware of Hawaii's precarious energy situation. You'd also have to be living in denial to think that drilling for oil in the ocean, in a wildlife refuge and national parks will bring relief. No, the age of cheap, plentiful oil is pau, but Hawaii is in an advantageous position to replace black gold with greener fuels and technologies, and there's good evidence that a convergence of interests and investment will push the state forward. That's what E. Kyle Datta, senior director of the Colorado-based Rocky Mountain Institute, believes. The institute has established an office here and has been enlisted by the state, among others, to help lay out a path to a prudent energy future for the islands. Sierra Club director Jeff Mikulina describes Datta as "a really blue-skies kind of guy," someone who doesn't let naysayers or obstacles check problem-solving or achievement. "When folks say 'it can't be done that way,' Kyle just goes, 'Oh, well, then we'll just do this, and this, and this instead,'" Mikulina says. That attribute is what distinguishes Datta and the internationally respected RMI. It's Web site says RMI is "an entrepreneurial nonprofit organization that fosters the efficient and restorative use of resources to make the world secure, just, prosperous and life-sustaining. We do this by inspiring business, civil society and government to design integrative solutions that create true wealth." Datta puts it more succinctly: "We're a think-and-do tank." And what RMI is thinking about and doing in Hawaii is focusing on energy. For a modest $200,000, the state has contracted RMI to help tune its energy plan and policies to put in place all the elements needed to shift from a wholly oil-based economy to one that incorporates diversified, renewable sources. "Government policy should accelerate the market, not command and control, but to use the natural profit system to do the right thing." Hawaii has tinkered around the edges of renewable energy development for decades, but as instability in oil-producing regions and global demand drive oil prices higher, the need for alternatives has become even more acute. "There's nothing like $70-a- barrel oil to wake everybody up," says Maurice Kaya, chief technology officer at the Department of Business, Economic Development and Tourism. Kaya notes that while consumers, who have felt the squeeze on their pocketbooks for years, and environmental advocates have long been pressing the renewable agenda, business interests are seeing the brighter light of change. "We also have economists talking about inflationary pressures, largely driven by fuel and energy prices," Kaya says. "There is now, today, a stronger collective desire to try to do something about being so reliant on oil." It's not only economic survival that is spurring new energy development, Kaya says. 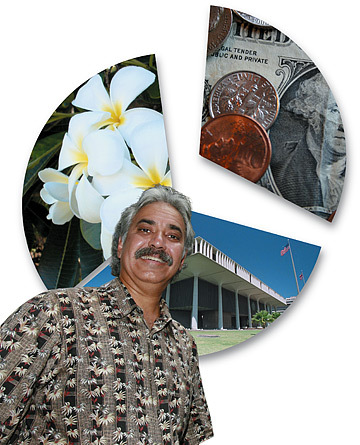 Hawaii presents opportunities to make money and making money is key to advancement. "The will and the money go hand in hand," he says. The will has been demonstrated by state leaders, both Governor Lingle and the state Legislature, who have put in place policies that "prime the pump" for alternative energy, Datta says. Money enters into that framework and under current circumstances, investment in Hawaii pencils out. "The economics of renewable power and fuels against the price of oil today are very beneficial in a faraway place that is blessed with this kind of renewable base," Datta says. "Why would Shell Oil Co. build a plant (for wind energy) here? It's a great investment." Government's role should be to encourage, he says, such as providing subsidies for renewable energy development, rewarding citizens who change over to more efficient vehicles, businesses that adopt efficient practices and developers who build homes with conservation in mind. "If we set the stage by creating good policy, then we become more attractive to private capital," Datta says. Kaya sees that happening, particularly in biofuels. In the past, increases in oil prices would stir interest but dwindle when prices dropped. That won't happen now, Kaya says. "I don't expect that the kind of investments made today are going to be marginalized because prices come down. That's not going to happen." In fact, Kaya says, interest in biofuels has steamrolled. "There isn't a week that goes by when we don't get calls from folks asking about (incentives and programs), wanting more information about how they can do this, what else is being done and how they can get on board." With trade winds, sun, geothermal and a pounding surf, Hawaii is gifted with many alternative power sources. The Rocky Mountain Institute is helping the state map out a strategy to harness new sources of energy and reduce Hawaii's dependence on oil. 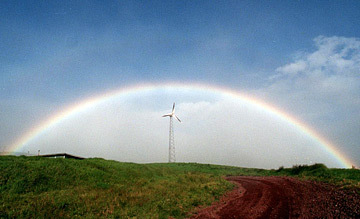 Kahua Ranch, on the Big Island, uses wind turbines to help supply power to a greenhouse, homes and shops. He repeats the benefits of developing biofuels for transportation in the islands. "We all like to see open space, we want a robust agriculture industry that can grow fuel crops and food for more sustainability. And there are many, many companies -- venture capitalists interested in investing in new technologies, conventional Wall Street brokers and oil companies -- who see the opportunities here and it's these companies, the private sector, that moves and shakes things." Kaya says Hawaii's isolation, closed economy and small market, often perceived as disadvantages, are a blessing when it comes to a blooming energy field. "Even though the market is small, the ability to penetrate the market is easier. For another thing, energy prices are high here to begin with, so for an investor trying to build a business case for a new operation, the numbers look good." Some companies are here for that very reason, he says, because the blueprints are based on a "higher target bar" and provide a "laboratory" for other locations where future energy costs are likely to mimic Hawaii's. Datta also sees Hawaii as a laboratory, one where the components for change are ready. The state has "a series of systems in a microcosm and the things that happen, created in this system, can happen earlier, and have applications for a wider system." He points to the Big Island, where he lives and where RMI's office is located, as a good example. "The Big Island has (potential for) geothermal, wind, hydro-power components that can expand wind power, biomass, waste energy, ocean thermal; it could have wave. All the elements and a readiness for change are there." There are also challenges, like power distribution over wide spaces, but Datta predicts that technology, new and existing, holds solutions that will allow up to 35 percent of energy needs to come from renewables in the next 15 years. Social challenges are also problematic. That's where RMI hopes to make a difference. Its approach is collaborative and inclusive, not only of communities, but of all the factors that need to come together for a new system to work. Producing biofuels, for example, isn't just a matter of identifying suitable crops, but land use, water rights, cultural sensitivities, environment protection, business practices, waste elimination, profitability and sustainability need to be folded in. "All the gears -- the agriculture gear, manufacturing gear, big energy users, car companies, others -- need to mesh. It's about doing the right things in the right ways," he says. RMI's consulting clients also include Hawaiian Electric Co. and the military. One of its most successful efforts, partly funded by the Defense Department, is an influential book called "Winning the Oil Endgame: Innovation for Profits, Jobs, and Security." RMI has no qualms about who it does work for. Datta emphasizes that its mission isn't ideological or political. "Our model is to change on the fundamental level the mindset of people who make the rules," he says, "to have a catalytic role." He sees this happening through a generational transformation among Hawaii's institutions with "new leadership that understands and has grown up with some of these issues." "Think of this transformation: The president of HELCO (Hawaii Electric Light Co.), Warren Lee, said in December that HELCO needs no more fossil fuel plants, but needs to go all renewables; HECO says it wants to use ethanol. They are the ones who make the rules." Datta says change is evident among other rule-makers, "a Republican governor and a strongly Democratic Legislature, saying, yeah, we need to make these changes to go forward and we need to do it with a comprehensive energy system, not just a rifle shot, but with efficiency and diversity." For Hawaii, there should be a shift in a "formula where we're not just buyers" of energy, he says. "We need to be the producers and creators of it. We can displace an out-economy with an in-economy." RMI's consultants don't push clients. "We don't say we have a bunch of people who are smarter than you. We say we have a set of people who see the problem a little bit differently. The different perspective starts them thinking and they come back with their own ideas because they know the area so much more deeply and how to apply what they know best." Datta says RMI incorporates environmentalism, but isn't an environmental group. "We believe in whole system sustainability and that integrates environment, social, political, economic elements. We care equally about prosperity and the well-being of people." Like Datta, RMI is rooted in pragmatism. Its financial model is a three-legged stool with consulting work bringing in half its revenue. "This is important because it says that the real world believes in the ideas we present," he says. Additional funds come from foundations for "think tank" work and from individual contributors "who say what we do matters to them." But it's not all about dollars and cents. Datta's "blue skies" idealism is clear when he talks about a Hawaii not restrained by the yoke of oil. "I see a prosperous community that still has the essence that makes it a wonderful place, where there are beautiful beaches, warm, friendly faces, strong agriculture, a place where people are better educated, have better social mobility, because we have better technology behind us. Where we have a much lighter footprint on the planet because we're living in efficient buildings, driving efficient cars, making our own power. "This is a good time for Hawaii. Everyone knows what we want to do. If RMI can help the process along, that's what we seek to do."